Frank H. Woods was born near Belvidere, Ill., in 1868 and was graduated from the University of Nebraska in 1890 with bachelor of law and bachelor of literature degrees. He completed his graduate work at the Law College, Columbia University. He was associated with the law firm of Harwood, Pimes and Kelly from 1892 to 1897. From 1904 to 1910 he was a partner in the law firm of Woods, Hall and Pound. He then became the head of the law firm of Woods, Woods and Pitken. 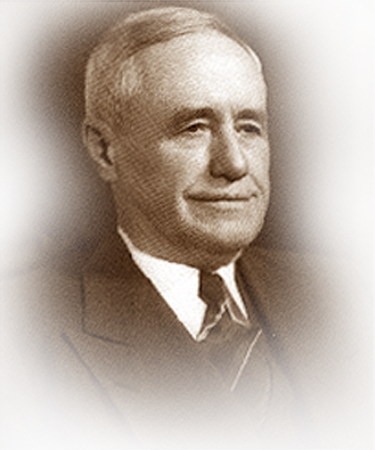 Woods founded the Lincoln Telephone and Telegraph Company in 1903 and served as president and chairman of the board from 1904 to 1946. He then continued to serve as chairman until his death in 1952. He pioneered the use of the dial telephone and his company was the first large company to use it. He was chairman of the National Telephone Association and in that capacity was the chairman of the “Committee of Seven” that negotiated the Kingsbury Agreement with Bell. This agreement provided unified, consolidated telephone service for the whole nation and resulted in marked improvement in service to the public and in establishing the Independent industry on a sound financial basis. Frank Woods received an honorary Doctor of Law Degree from the University of Nebraska in 1945. He also acquired Addressograph International Corp., in 1929, served as its chairman, and following a merger, served as chairman of Addressograph Multigraph Corp. until his death in 1952.